Although you did miss Plath's Meats in Roger City. They have some of the best smoked chops! It was a regular stop whenever we pulled into the Marina. Back in 92 I bought a house in Oscoda. It was right after the base closure and at that time there were over 400 homes for sale. We ended up stealing one and selling it at a healthy profit in 98. We just got tired of the drive. Again, awesome RR! Thanks for the ride! Thanks! Glad you are enjoying the ride. Plath's Meats sound pretty good! 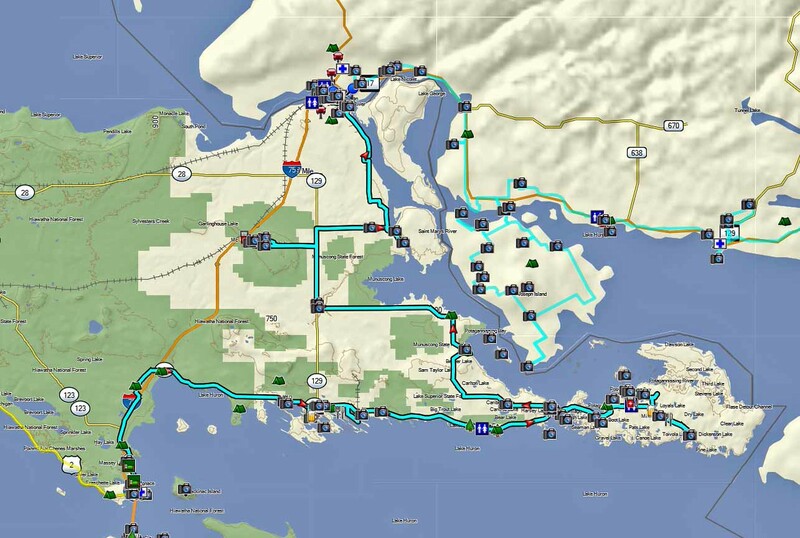 I previously covered all this in A CannonTour of the Eastern Upper Peninsula so I'll refer back to what I have already presented to close the loop back to the Sault. Thanks to those that followed along! 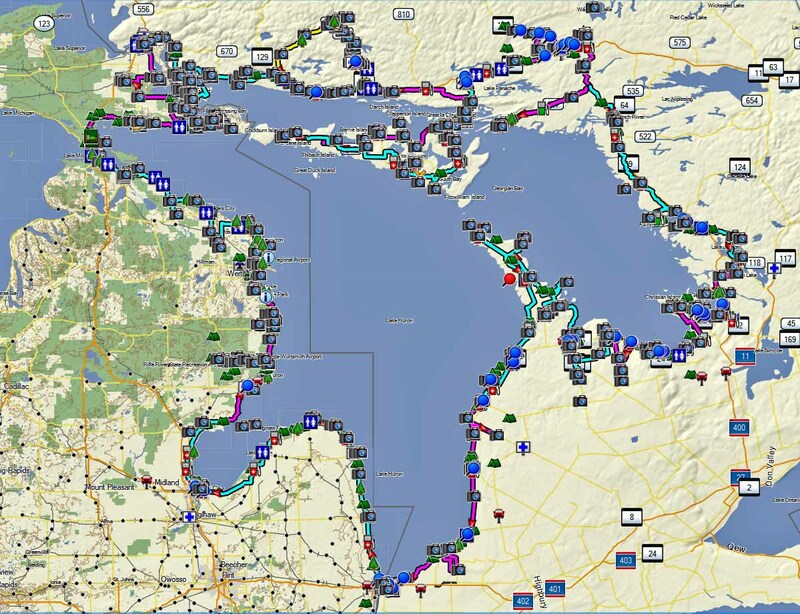 Hope this encourages a few more people to check out some of the great points of interest, travel, and scenery a trip around Lake Huron has to offer. Again, thanks. In my well over 60 years in Michigan, I had never heard of Mill Creek Discovery Park. I really need to get there. Thanks so much for such a well thought out and educational RR. I've blasted through many of those same places, on my bike and car, without a thought or clue of the rich history and events that took place there. I couldn't stop reading it for the last couple of days. All the links were so worthwhile to follow and find even more. I don't how you can get any riding done between the photos. Just fantastic, thanks! I told cannonshot this before, and I'll just re-iterate it again, the man should compile these reports into a book for educational reasons and the guy could probably make a buck or two in the process. I'd buy a copy for my kids to read. This stuff is right beyond that TV Monitor. Thanks! I hope you have some fun up at the park. Looked like an interesting place. I wanted to see that water powered saw operate. Thanks! I'm glad you found the information interesting and entertaining. Like you, I'm often amazed about some of the things we drive past without knowing that there is more to them. Thanks! It is kind of fun digging out some of this info and visiting the places to see things first hand. Interesting to look back and see how things were and how people operated years ago. Thanks so much for riding along and for the great feedback! I hope the report and the related materials encourages many more people to check out a trip around Huron for themselves. Seems like Michigan has more than its share of cold war air bases that are now shut down. Thanks for the RR, Cannonshot. I am enjoying a bunch. I am a life long Michigander. I live about 35 miles west of Port Huron, and I have been to most of the Michigan locations you stopped at - but, you have better pictures! 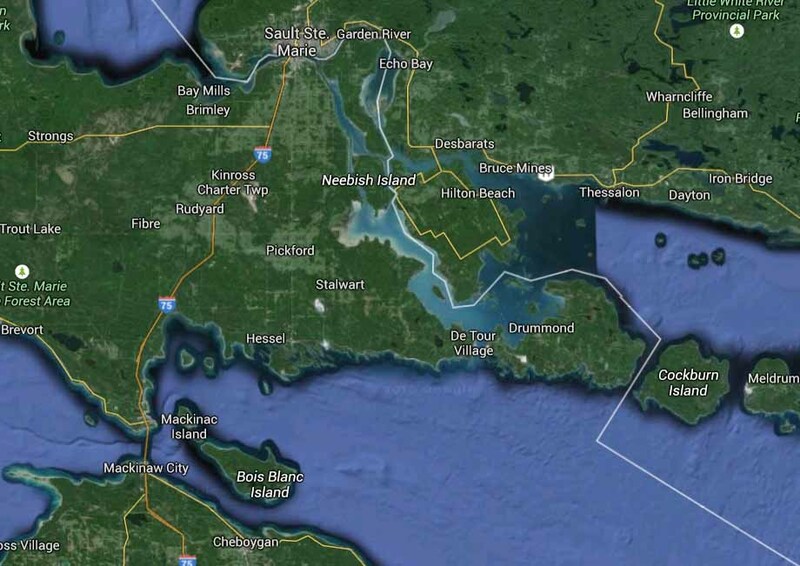 About 25 years ago, I was driving east towards Oscoda on the scenic byway next to the AuSable. I was enjoying the beautiful sights when all of a sudden a large shadow and great roar came from behind me. Two B52s were on approach and flying just over the treetops. I almost pissed myself! I'll never forget that sight. My Dad is a WWII vet who spent a small bit of time stationed at Selfridge. Some of his memoribilia is in the Wurtsmith museum. Thanks! Fun story. I can see where a couple of those big loud bombers coming up from behind would startle about anyone. Neat that your dad has some stuff at the museum. as usual, some really great intel and history on an area I have yet to wander. Thanks for putting this all together so that those of us in the cube farms get a chance to leave the building, at least virtually. You are so right about that bridge being a bit wobbly on a bike. And , being able to see the waters below you is amazing. Thanks for all your work. Thanks Jeff! It is a great area to wander through and explore. Thanks! I'm glad you enjoyed the ride. Indeed it is a little wobbly, especially on a small dual sport with knobbies. Thanks for tuning in Andy! Thank you, always a great read, very hard to tear myself away from it. Thanks! I'm glad you found it entertaining. As a side note, I'm still confused about this being called northern Ontario. This might be the range of significant development making it seem like the northern part of the province, but there is a hell of a lot more Ontario north of this region. But what do I know? I'm just passing through. Canada was formed in 1867 out of four British colonies. The territory that originally formed Ontario consisted of those areas that hugged the Great Lakes and did not extend much further north. Everything north and west of this land was the Northwest Territories except for BC and a postage stamp of land around Winnipeg that was Manitoba. In 1905, the government formed the provinces of Manitoba, Saskatchewan and Alberta from the Northwest Territories. 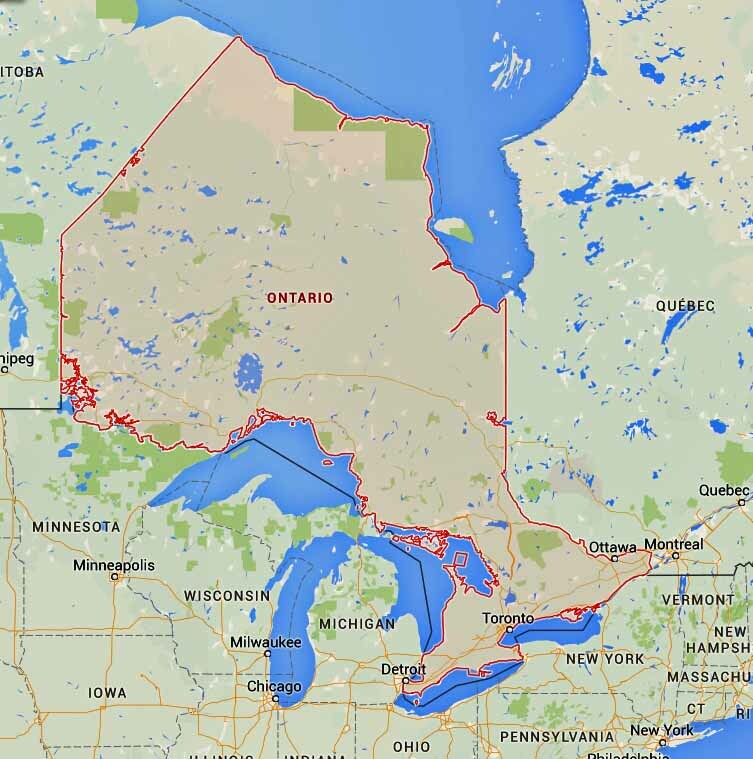 Ontario and Quebec were increased in size to their present boundaries. In Quebec they had the good sense to name this new territory "The New Territory". Ontario just called it "Northern Ontario". Thanks for the excellent explanation. One could see how a simple country boy like myself would wonder about it with so much of the province being much further north. 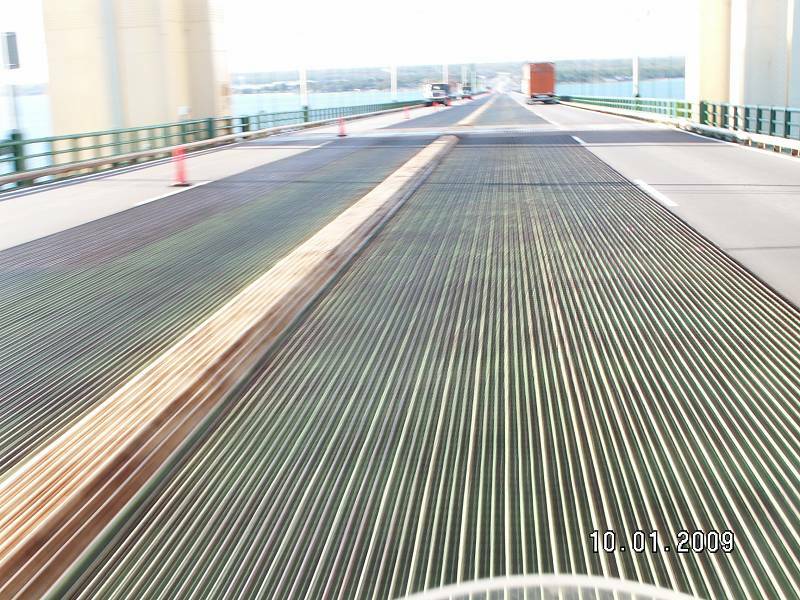 If you were planning on visiting Detroit, you actually save about a couple of hours by going on the Michigan side. You don't have to go around Lake St. Clair. Yeah, very true, but I had a stack of POIs to check out on the Canada side that were part of the whole exploration component of the trip. I think I'll pick all that up on another trip sometime soon.